If every change is for the worse, what then? I saw a great Brexit cartoon this week from “Matt,” who appears in the Daily Telegraph. Two British MPs are ordering lunch in the House of Commons restaurant and the one doing the talking tells the exasperated waitress: “I don’t want the soup and then definitely not the lamb. And my friend doesn’t want the melon and is fiercely opposed to the fish.” (You can see it by scrolling down Matt’s twitter feed.) What they do want I suppose she will simply have to guess. 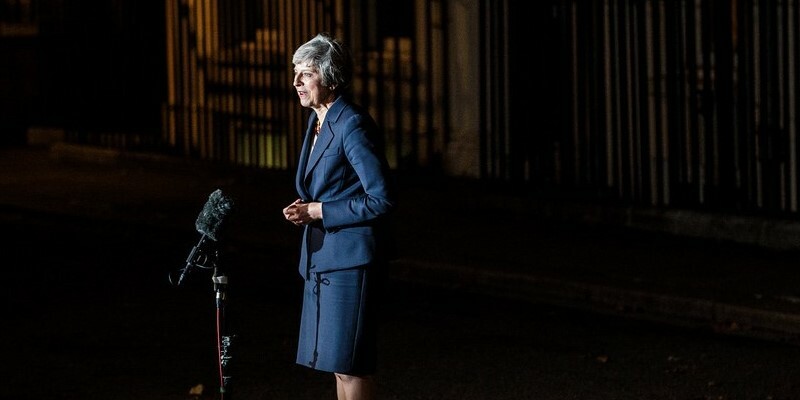 In much the same way, the House of Commons this week expressed its very strong distaste for the Brexit plan U.K. Prime Minister Theresa May (pictured above) cooked up with the European Union over the last two years. It fiercely opposed it, by a vote of more than two to one. But what the House is for, it hasn’t yet made clear. By rights May should be as exasperated as the waitress in Matt’s cartoon. Instead she carries on stoically. In his column in the Wall Street Journal Thursday, Daniel Henninger combined Britain’s Brexit stalemate with the current shutdown of the US government to conclude, as its title says, that “Gridlock is the new normal.” As the deck continues: “We can now stop anything we don’t want, but can’t enable anything we need.” And he didn’t even mention pipelines, which are this country’s world-class example of politics stuck in very deep mud, muskeg even. I’m not actually sure Brexit is the best example of Henninger’s point. My own view is the current stalemate is a case of no conceivable set of institutions being able to satisfy the several constraints imposed on a deal, in particular, that the United Kingdom run its own trade policies, that Northern Ireland remain in the U.K., and that there be no palpable border between Northern Ireland and the republic to the south. To me that’s a Rubik’s Cube, except that Rubik’s Cube can actually be solved (if never be me!). But in the main Henninger is probably right. In Good as Gold, Joseph Heller’s third novel—his first was Catch-22—Heller has his protagonist, university professor-turned-White House advisor Bruce Gold, reflect periodically that “Every change is for the worse.” Of course, if every change really is for the worse, then you’re at an optimum. You shouldn’t make a change. You should just leave things as they are. People have enough trouble deciding whether changes they themselves are contemplating are for the better or the worse. (I say “people.” I know I have this problem. I simply assume everyone else does, too.) How can societies do it? All the individuals that make up the society first have to figure out how they each feel about the proposed change and then, if the change requires some sort of official sanction, they have to decide how to aggregate their individual preferences so as to come to a decision. One possibility, perhaps the easiest to consider, is that everybody in the society agrees the change is for the good. Then the decision can be unanimous and there’s no problem (unless some people try to game the outcome—maybe those who took economics in college—and pretend they’re opposed). There obviously aren’t many proposals on present-day political agendas that everyone approves of. If everyone approves, they’ve probably already been made. Yet even in the apparently dysfunctional United States Congress, penal reforms that discourage incarceration for non-violent acts and encourage prisoner rehabilitation recently got broad bipartisan support, even as politics barrelled toward the government shutdown. But what if, as is usually the case, while some people think the change is for the good, others believe it isn’t, possibly because it would hurt them personally? Majority rule, that bedrock of democracy, suggests that if most do people favour the change, it should take place. But that’s not very kind to the minority. And it may bring about pretty serious injustices. What if the majority would benefit from the change, but only slightly, while the minority would be very badly hurt? In theory the majority could simply ram the deal through. In practice, the minority would probably raise hell. That might in the end persuade the majority to back off. But it might not. What seems to have happened in recent decades is that minorities have found more and better ways to oppose changes they don’t like. Henninger mentions social media as a new mechanism that allows small numbers of people to have outsized influence. In Canada we’ve just seen the Minister for Foreign Affairs personally greet a new Saudi refugee who got admitted to the country by barricading herself in a Thai hotel room and appealing to the world for protection from her allegedly oppressive father and brother. It’s unlikely she could have achieved a similar result in a bygone era by writing letters or sending telegrams. Of course, people being opposed to something doesn’t mean it can’t eventually go through. The other part of politics, the non-voting part, the deal-making part, should be able to bring about agreement. If the change really is for the good, if there are big gains to be had by a substantial number of people, those who gain should be able to pay off losers and still be better off themselves. But somehow, some way, they’ve got to figure out how to make that deal. It could be that what looks like gridlock may actually just be slow, grinding deal-making. Nothing says deals have to be made fast. Supporters of the proposed Canadian pipelines argue they would bring big benefits to the country. “If that’s the case,” say at least some opponents, “we need our share of the benefits.” Working out the exact details of the sharing may take time. Or it could be that we are now so deferential to dissent—which is not in itself a bad thing—that we have essentially given people veto power over all sorts of decisions, whether or not they themselves are hurt by them in any material, as opposed to ideological, way. If that’s the case, we either live with the empowerment of sometimes tiny minorities or we figure out a way to re-enfranchise majorities. If not, it won’t really matter whether every change is for the worse or not. Change simply won’t be possible.